Guests aboard the hotel barge Panache always enjoy the excursion to Zaanse Schans during their cruise of Holland. This extensive conservation area was created in the 1960s in order to preserve the buildings and crafts of the country’s industrial revolution in the eighteenth and nineteenth centuries. With a dozen windmills, a collection of traditional houses and workshops and a number of museums, it offers an unparalleled insight into Dutch social and industrial history. The windmill is an icon of the Dutch landscape. At Zaanse Schans the horizon is dominated by twelve of them, each with its own unique story. De Zoeker, for example, is thought to have been built all the way back in 1610 as a polder mill, before being converted to mill oil, then paint, then oil again. De Bonte Hen has been struck by lightning numerous times, and yet survives today. Discovering the individual identity of each of these beautiful structures is all part of the fun while exploring the site. Many museums claim to “bring history to life”, but Zaanse Schans is one of the few places that actually achieves it. By housing its many museums in authentic buildings and offering hands-on workshops, it’s possible to get a real sense of what life was like in the Netherlands in the eighteenth and nineteenth centuries. A cottage from the 1850s, relocated from the village of Jisp, offers a fascinating insight into the life of fishermen in the Zaan region. The authentic interior, including a traditional box bed, makes the perfect backdrop for a photo dressed in local costume from the period. The Honig Breethuis, on the other hand, is a charming example of a wealthy merchant’s house from the 1830s. The clog workshop set up in an eighteenth-century warehouse is always a popular attraction. You can both learn how to make the famous Dutch footwear and view one of the most extensive clog collections in the country. Carved, painted, “ice clogs”, horse clogs… the array is impressive! You can also gain an insight into sail making at the Weaver’s House, where the looms are still used to demonstrate this vital craft for making windmill and boat sails. 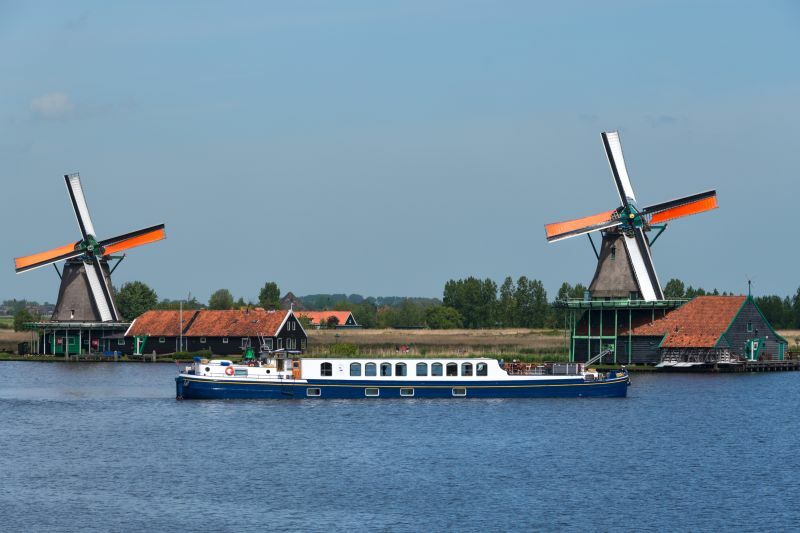 Our cruise aboard Panache gives you a leisurely afternoon to explore the delights of Zaanse Schans and its windmills, museums and experiences. It’s a fantastic way to learn more about the heritage of the Netherlands.